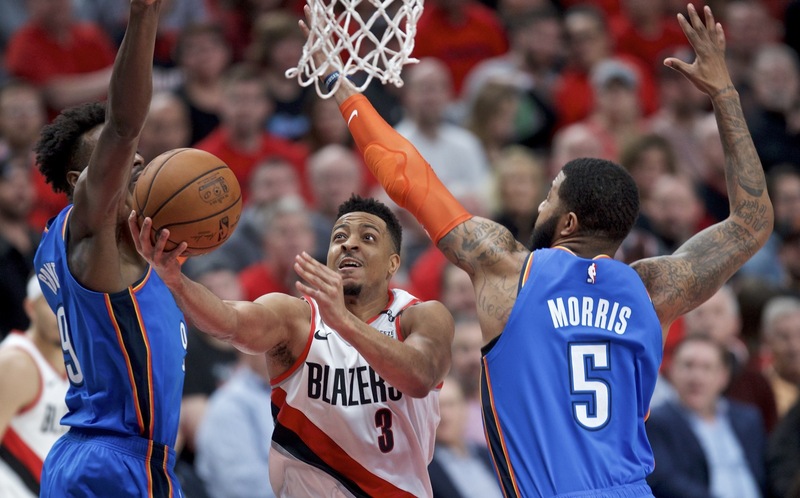 PORTLAND, OREGON - CJ McCollum had 33 points, Damian Lillard added 29 and the Portland Trail Blazers took a 2-0 lead in their first-round playoff series against the Oklahoma City Thunder with a 114-94 victory on Tuesday night. In Toronto, Kawhi Leonard scored 37 points, Kyle Lowry bounced back from a scoreless playoff opener with 22 and the Raptors routed Orlando to even their Eastern Conference first-round series at one win apiece. 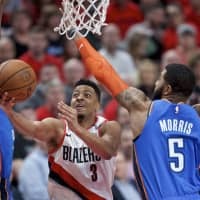 In Denver, Jamal Murray missed his first eight shots before a scorching fourth quarter in which he scored 21 of his 24 points, leading the Nuggets past San Antonio and knotting their playoff series at a game apiece. Denver was in danger of losing a second straight game at the Pepsi Center after posting the NBA’s best home record (34-7) during the regular season. The Nuggets trailed 78-59 late in the third quarter before closing the game on a 55-27 run. The series shifts to San Antonio, where Denver hasn’t won since 2012, for Game 3 on Thursday night. Paul Millsap added 20 points for the Nuggets and Nikola Jokic just missed his second triple-double of the series, scoring 21 points, pulling down 13 rebounds and dishing out eight assists.